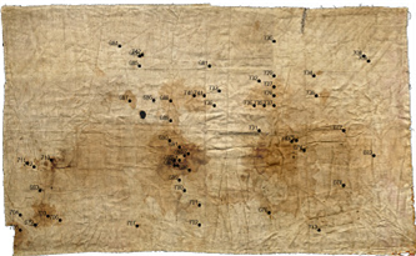 Recent revelations in Nature suggesting the cloth now called the Turin Shroud may have originated in India reminds us of the legends about the Apostle Judas Thomas who likely traveled to Muziris on the Malabar Coast in A.D. 52. There he founded several church communities. The story of his sea journey to India reminds us there was active trade with that city and other seaports on the Indian subcontinent. Maybe we should be looking in India for examples of linen cloth similar to the Shroud. 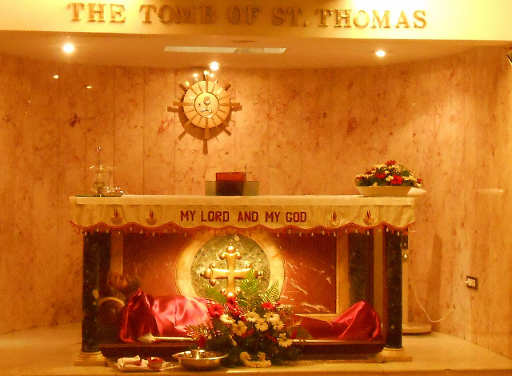 Pictured, the tomb of St. Thomas the Apostle in Mylapore, India. Muziris was an ancient seaport and urban center in the Malabar Coast (modern day Indian state of Kerala) that dates from at least the 1st century BC, if not before it. Muziris has found mention in the bardic Sangam literature and a number of classical European historical sources. The port was a key to the trade between southern India and the Phoenicians, the Persians, the Egyptians, the Greeks and the Roman Empire. The important known commodities exported from Muziris were spices (such as black pepper and malabathron), semi-precious stones (such as beryl), pearls, diamonds, sapphires, ivory, Chinese silk, Gangetic spikenard and tortoise shells. The Romans brought money (in gold coins), peridots, thin clothing, figured linens, multicoloured textiles, sulfide of antimony, copper, tin, lead, coral, raw glass, wine, realgar and orpiment. The locations of unearthed coin-hoards suggest an inland trade link from Muziris via the Palghat Gap and along the Kaveri Valley to the east coast of India. Though the Roman trade declined from the 5th century AD, the former Muziris attracted the attention of other nationalities, particularly the Persians, the Chinese and the Arabs, presumably until the devastating floods of Periyar in the 14th century. The exact location of Muziris is still not known to historians and archaeologists. It is generally speculated to be situated around present day Kodungallur, a town situated 18 miles north of Cochin. Kodungallur in central Kerala figures prominently in the ancient history of southern India as a vibrant urban hub of the Chera rulers. A series of excavations were conducted at the village of Pattanam in North Paravur by Kerala Council for Historical Research (an autonomous institution outsourced by Kerala State Department of Archaeology) in 2006-07 and it was announced that the lost port of Muziris was found. The rapid conclusion invited criticism from historians and archaeologists and started a healthy debate among historians of south India. 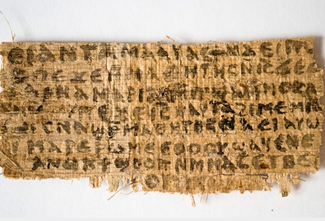 OFF TOPIC BUT*: LiveScience has just published a new article by Owen Jarus, ‘Gospel of Jesus’s Wife’: Records Hint at Improbable Journey of Controversial Papyrus. Now, records obtained from various sources by Live Science — many of which are publicly available online in databases in Florida and Germany, as well as on the Internet Archive— show that if the papyrus is authentic, the story behind how it came to the United States would be astounding. The records also describe how, if the papyrus is fake, the forger (or forgers) may have crafted such a realistic specimen. * We’ve discussed it many times. CNN focused on the question of the authenticity of the controversial "Shroud of Turin," in the first episode of its new pre-Easter series "Finding Jesus." Those challenging the authenticity of this ancient relic point to carbon dating tests done at three independent labs in 1988 that dated samples of its cloth to AD 1260-1390, which coincides with the first appearance of the shroud in France in the 1350s. Believers in the shroud’s authenticity have questioned the authenticity of the tests. What many do not know is that we do in fact have an unquestionably authentic burial shroud from a tomb in Jerusalem that has been carbon dated to the 1st century. Any consideration of the "Shroud of Turin" should begin with a comparison of what we know rather than what we might want to believe. 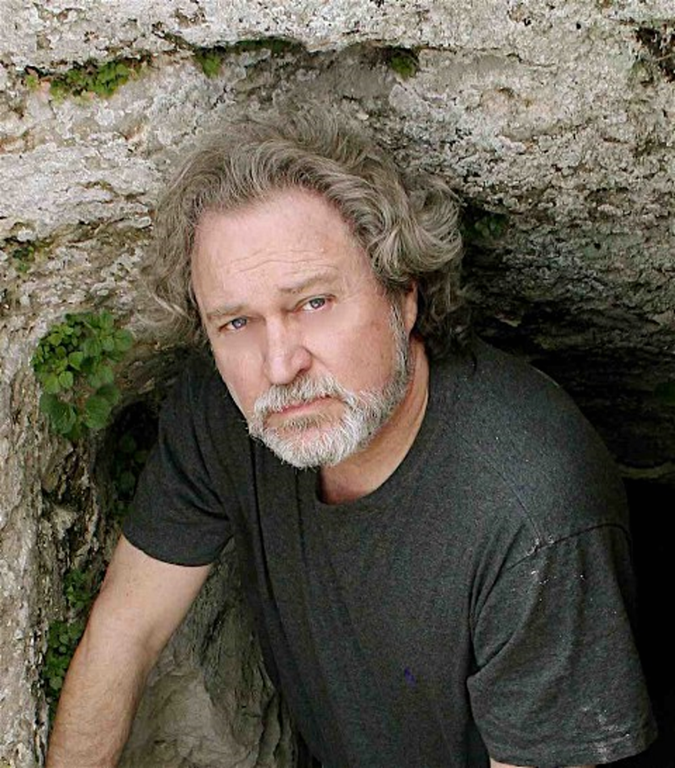 The tomb of which he speaks is the tomb that Tabor and Shimon Gibson found in June of 2000. 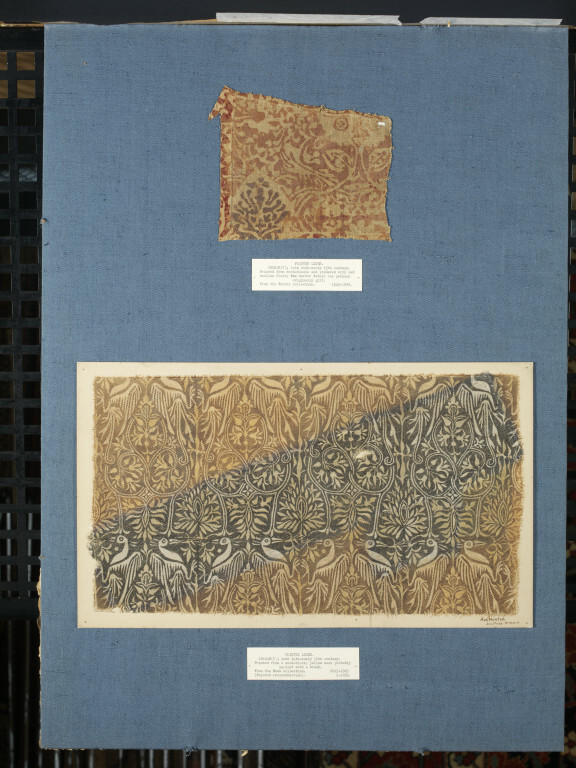 …Textile analysis was done on the cloth–it turned out to be a mixture of linen and wool, not woven together but layered with a separate head piece. It had a distinctive 1st century weave–in contrast to the Shroud of Turin…. The Tomb of the Shroud continues to offer more surprises. We recently noticed that the mitDNA tests of two of the individuals in this tomb match the polymorphisms of two individuals in the Jesus family tomb–namely skeletal materials taken from both the Yeshua and the Mariamene ossuaries. What the implications of this might be, and whether there is any possible relationship between these two families, remains to be explored. Hat tip to Joe Marino for spotting the posting. 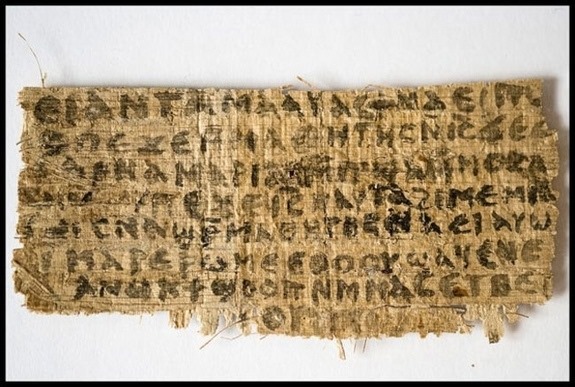 "It" is the controversial little scrap of papyrus, written in Coptic, that seems to have Jesus referring to "my wife," in contrast to the traditional stance that affirms Jesus’ perpetual bachelorhood. Both the material and the script looked authentically ancient at first glance, and though the notion of Jesus having a wife was remarkable, these "lost" Christian writings, such as the Gnostic Gospels, are full of unorthodoxies. Archaeologists in Spain say they have found one of the world’s earliest known images of Jesus. 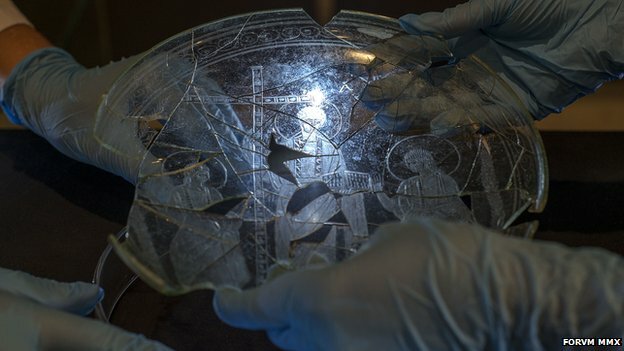 It is engraved on a glass plate dating back to the 4th Century AD, reports from Spain say. The plate is believed to have been used to hold Eucharistic bread as it was consecrated in early Christian rituals. It measures 22cm in diameter and fragments of it were unearthed outside the southern Spanish city of Linares, ABC newspaper reports. Scientists working for the FORVM MMX project found it inside a building used for religious worship in what remains of the ancient town of Castulo. 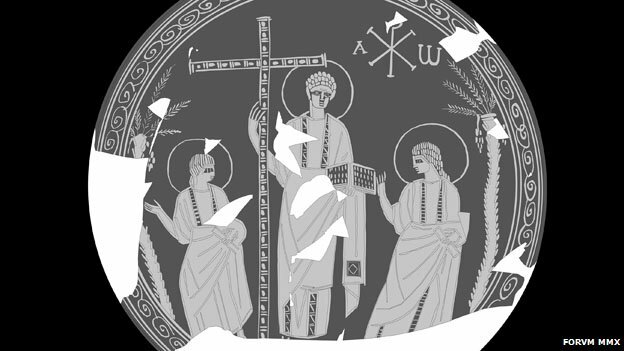 The find made scientists "review the chronology of early Christianity in Spain", FORVM MMX project director Marcelo Castro told El Mundo newspaper. El Mundo notes that Christ looks very different from later depictions: he has no beard, his hair is not too long and he is wearing a philosopher’s toga. There is quite a bit on the FORVM MMX project Facebook timeline running back to September 30; There is a link to a YouTube uploaded October 1.